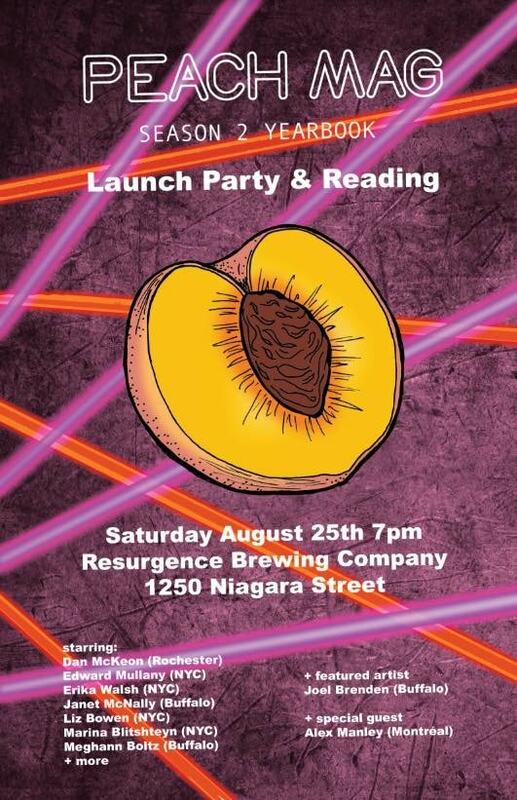 Buffalo-based literary magazine Peach Mag will celebrate the end of its sophomore season with the launch of Peach Mag: Season 2 Yearbook — a locally designed, in-print anthology that features the work of a star-studded selection of Season 2 contributing writers and artists — with a night of readings and art at Resurgence on Saturday, August 25th. Helping the editorial team celebrate will be a lineup of readings by local favorites — Dan McKeon, Janet McNally, Marina Blitshteyn, and Meghann Boltz — as well as by many visiting writers — Alex Manley, Edward Mullany, Erika Walsh, and Liz Bowen — who will be coming in from cities such as New York and Montreal. The night will also feature the artwork of local artist, book arts designer, and publisher of Linoleum Press, Joel Brenden. Peach Mag was founded in the summer of 2016 by three friends who wanted to establish a literary community for young and emerging writers. In the two years since its launch, the magazine has grown from a Buffalo-based literary blog to a publishing outlet with a national reach. Peach Mag still publishes a new creative writing or visual art feature online at their website every Tuesday and Friday, but now also hosts Episodes, a seasonal reading series that brings some of the most exciting contemporary American and Canadian writers to Buffalo, sponsors The Peach Gold, an annual poetry award judged by icons of the American poetry scene — this year’s judge for its inaugural prize was Morgan Parker — and writes a column of literary news and micro-reviews for Buffalo’s beloved altweekly, The Public. The magazine has also announced a move into print with the release of a couple upcoming books — most notably, the anthology inspired by the #MeToo movement, With You: An Anthology of Withdrawn Poetry — and has teased even more publishing projects in the seasons to come.